Nobody does it better than Chinese Malaysians. Roast pork, that is. But the pork masters of Malaysia have a serious contender in this San Francisco Bay area porchetta peddler. 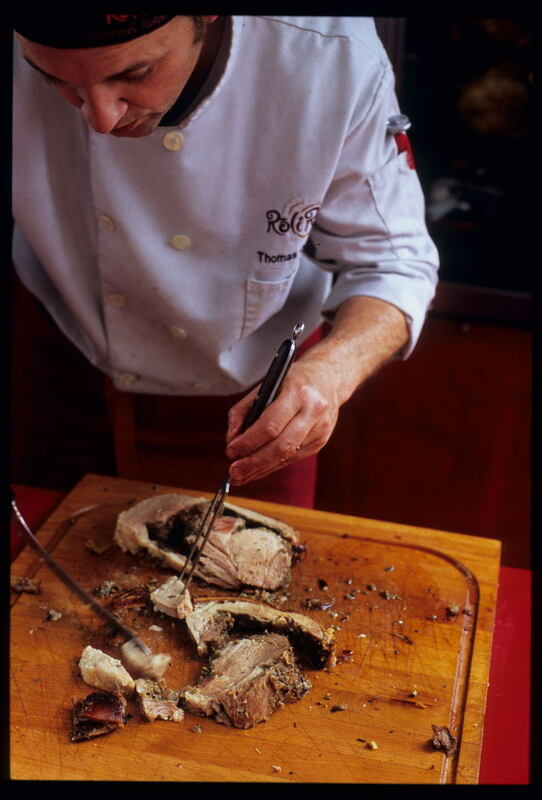 Thomas Odermatt, a Swiss national, roasts pork, along with whole chickens and the occasional leg of lamb, in his rotisserie truck and sells the finished product at area farmer's markets. We found him a couple of Saturdays ago at the San Francisco Ferry Plaza Farmer's Market. Porchetta (por-KET-ta) might be called Italy's favorite sandwich meat. We first sampled it a few years ago in southern Piemonte at the Fiera del Bue Grasso, a celebration of the Piedmont region's native (and truly enormous) bue grasso beef cows. On the way back to our car after the festivities we passed a husband-and-wife team doling out porchetta from a white truck much like Thomas's and then, unable to resist the clouds of meatiness following us down the street, doubled back. Before diving in we beheld our porchetta sandwich - an inconsequential white roll straining under a streaming, fragrantly herby tower of roast pork slices - and melted the snow clinging to our brows and lashes in its heat. That porchetta, moist and piggy in a way that American pork so rarely is, stands as one of the 'top tasties' of a two-week stay in one of Italy's most-lauded gastronomic regions. Thomas's home town isn't far from the Italian border, and he does his porchetta a la Italiana, long and slow and loaded with herbs. 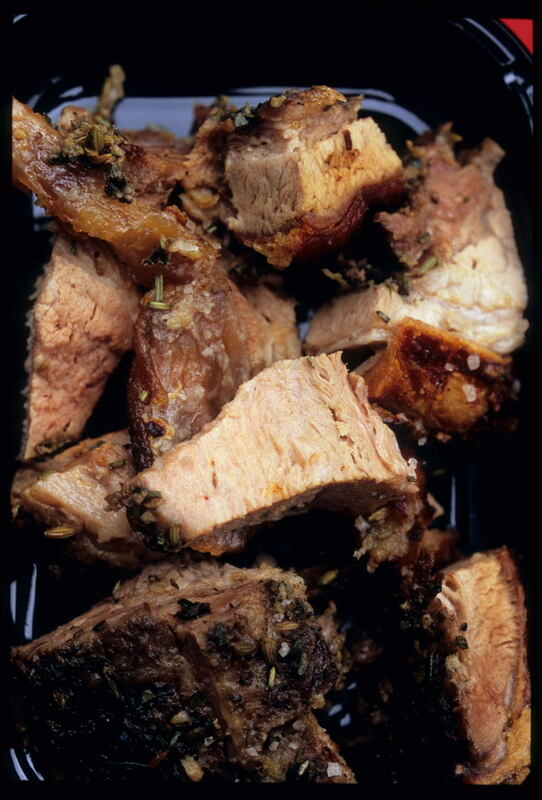 The dish is traditionally made with suckling pig ('Not so nice,' Thomas says, referring perhaps to the American reluctance to stare one's meal in the face); he uses a whole side or shoulder of the animal and rolls it around a stuffing of garlic, fresh herbs like rosemary and marjoram ('Not too much; it can be overwhelming. '), cracked black pepper, and fennel seeds, which he roasts 'until they pop, for the most flavor.' 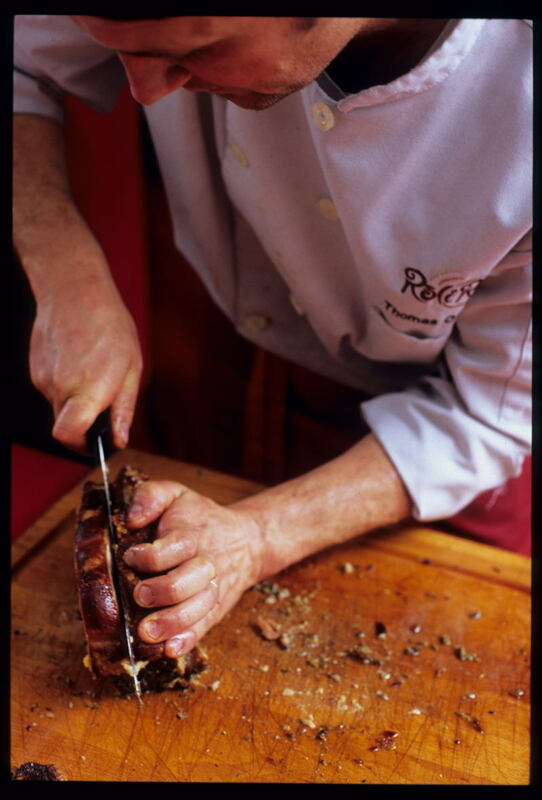 The 'pork roll' is skewered on the rotisserie and cooked for about four hours, until the skin is browned and crispy and the meat meltingly tender. His biggest challenge? Finding pork that's up to the task of spending an extended time over the fire without drying out. That means meat with the fat and skin intact - a given in Asia (thankd goodness!) but a rarity in the US. His pork, which he sources from a supplier out east, is raised on a small farm in the midwest. The American fear of fat is evident in the faces of the folks queuing in front of Thomas' truck. Most, opting for a takeaway of roast chicken and potatoes (which, cooked in a pan below the rotisserie, are bathed in bird juices), eye the slab of pork on his cutting board warily. Poor souls - they don't know what they're missing. We - Dave and I and a good, carniverous friend - nabbed the last bit of pork, and, after much inhaling accompanied by 'oooohs' and 'aaaaahs', ate it with our fingers. Within minutes every piece of crunchy crackling and yielding, herb-infused meat was gone. I continued to pick at the wee bits of soft garlic and shreds of meat left in the tray as Thomas, obviously (and justifiably) proud of his product, gave us the low-down on his method. This porchetta rivals any roast pork we've sampled in Asia and - yes, it's true - beats our fondly remembered Piemonte version, hands down. 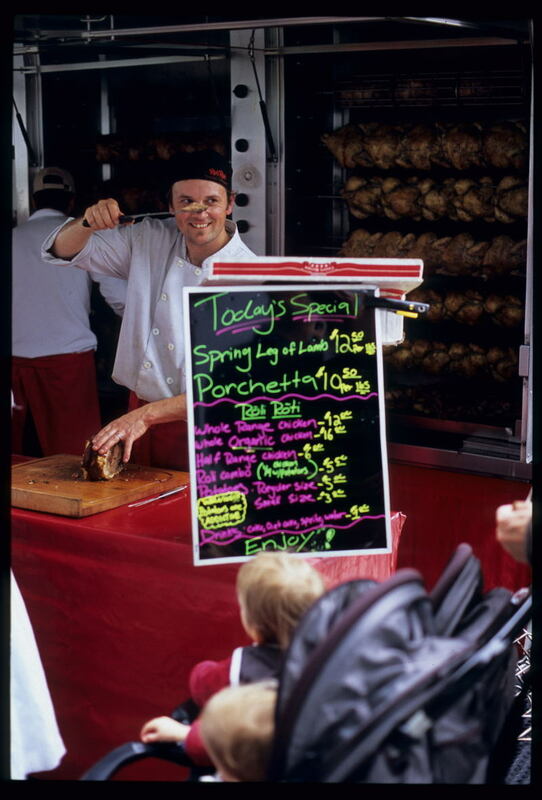 Pork-loving San Francisco visitors - if you're in town on a Saturday, make time for porchetta! And if you're a resident and haven't partaken of Thomas' masterpiece (and have no dietary or religious strictures), what the heck are you waiting for? Ooooooh... I haven't had that pork in ages. Not since my last visit to SanFran. I guess for Filipinos in Daly City, the roasted pig knuckles would be a high-end version of "cripy pata" (which is usually deep-fried). That last photo of the pork close-up really made me hungry...and I just had dinner. Oh, it's so mouth-watering to walk past that truck at the Ferry Building Farmer's Market and breathe in the aroma of roast meats! How interesting (and somehow wonderful) that a Filipino living in the Bay Area would learn about the pork knuckles roasted by a Swiss for the Filipino market in Daly City from two people living in Malaysia! Robyn and David, hats off to you and your wonderful blog. Your enthusiasm is contagious, and your writing and photos are mouthwatering. I eagerly await a book with your names on it! I am going to e-mail this to some of my Filipino friends in the area! Wow! I LOVE porchetta. My Italian grandmother always makes one for Easter, so the memory is still lingering. I never tried that, but I want to have it someday. yummy! just like lechon kawali! do you think porchetta will be a good idea for business here in the philippines? Catherine - good for you... amazing willpower! Nate - your comment begs the question - just why *do* you walk past without stopping? Carpetblogger - thanks for the heads up! Would've missed it entirely. Ooooh, love it when you guys do one of your rare "Not Eating Asia" posts!!!!! We went to the Old Oakland farmer's market, got in line, and found that the only thing on the menu was chicken! I have to email him and find out when they do the porchetta (only for SF? Only occasionally?). It wasn't Odermatt there, and the guy who was serving didn't seem to understand my question. That's OK. We stocked up on fresh cherries and white peaches, and headed to our favorite Shanghainese eatery nearby for some exquisite "xiao long bao". Sorry about that Jen! Yes, the pork is 'occasional' -- it just doesn't sell as well as the chicken. I'm sure you could ask to be notified if the pork is going to be on the menu. (A thought - perhaps Odermatt is franchising and this was one of the franchisees?) But what about the chicken? The potatoes roasted in the chicken drippings looked heavenly! We're going to our last Giants game at Pac Bell Park tomorrow (move date is next Saturday! ), so we're heading there early to try to catch Odermatt, and hopefully, some pork. I emailed them after our disappointment but never heard back from them. Whatever. Perhaps there'll be lamb, if there's no pork! We didn't have the chicken last time, although it smelled amazing. I don't think he's franchising -- the web site doesn't say so -- I think it was one of his staff, someone who spoke limited English. Hopefully he'll be there tomorrow -- we'll keep you posted! Ich bin schtolz uf diich. I wish it would come to any city in the country, so we all can enjoy and be happy and full!